First, you ate all of the best burgers in SF. Then, you ate all of the best under-the-radar burgers in SF. Now you’re just wandering around aimlessly, with no purpose, waiting, hoping that someone will deliver a new burger list so that you once again have a reason to live. 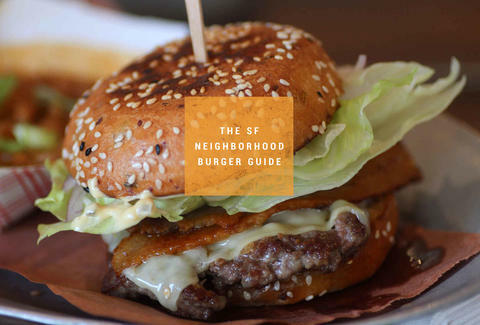 Well, today is your lucky day, friend: here are the best burgers in 30 different San Francisco neighborhoods. Grab your Fast Pass or call an Uber and let's get to it. Yes, everyone goes to The Front Porch for the amazing fried chicken, but since when do you do what everyone else does? The 8oz burger comes with house-made pickles and fries, but you’re going to want to go ahead and add cheddar cheese, applewood-smoked bacon, and (why not?) a free-range fried egg. You could share a pizza and some small plates, or you could man up and order the Prather Ranch burger on a grilled sesame seed challah bun. Add the Pt. Reyes blue cheese and the Starbelly bacon for burger perfection. The Zuni burger has been on pretty much every best burger list since it arrived on their menu 20+ years ago, and deservedly so. The ground beef is salted and peppered and left to "cure" overnight. It’s then cooked on a mesquite grill and arrives on a square of grilled rosemary focaccia with sides of house-pickled pickles and onions. The bad news? You can only order it at lunch or after 10pm. Sometimes it’s the bun that makes the burger, and in Kezar’s case, that is definitely the case. It’s a house-baked onion poppy seed-er that perfectly sandwiches the charbroiled meat. You can go traditional hamburger if you want, but you probably want to order the lamb burger with mint-lime aioli. Trust. 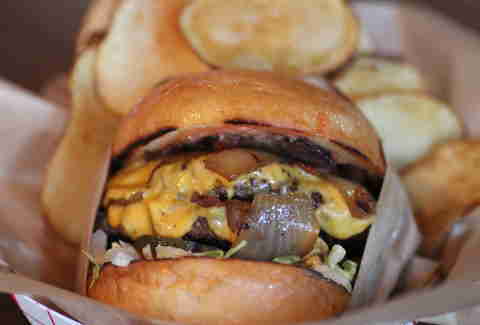 Umami Burger’s "Original Burger" is the quintessential Umami burger, if that makes sense (it makes sense). 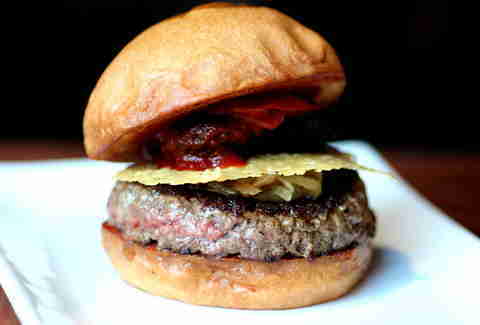 A 6oz patty is topped with shiitake mushrooms that have been sautéed in butter, caramelized onions that have been sautéed for an hour, glazed oven-roasted tomato, Umami ketchup, and a Parmesan crisp. And all of that deliciousness lives between the iconic U-branded bun. Serpentine serves a more "upscale" burger. You can tell this because it comes with arugula on it. Don’t let that put you off though. 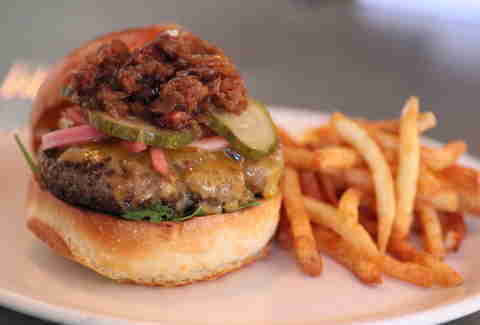 It’s still a big, beefy burger made with Prather Ranch beef and served with pickled onions and house-made bread-and-butter pickles. Yes, there will be a line. But you’ll forget all about it once you’re sitting outside and biting into a juicy double cheeseburger that’s exactly how a juicy double cheeseburger should be: American cheese, lettuce, tomatoes, pickles, and a secret sauce… all on a toasted egg bun. The sausage and beef patty on the Hood Burger is soft, rich, and made even more delicious with the addition of bacon, Jarlsberg cheese, pickles, onion, and fried egg. Bonus: it's served on a garlic bread roll. Double bonus: they have Four Roses bourbon on tap. 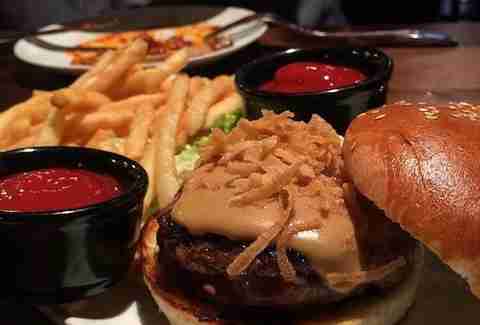 If you’re going to throw down $20 for a burger, this is the burger to throw it down for. "Le Grand" uses a patty made with grass-fed proprietary grind and topped with Marin Brie, roasted onion, and smoked bacon. Brioche bun, FTW. Every wondered what’s going on in that octagon-shaped building attached to the Days Inn in Hayes Valley? Only your new favorite burger. Get the signature burger, which comes with double (duh) Niman Ranch patties, Swiss AND American cheese, lettuce, tomatoes, pickles, onions, and their specialty mayo, all on a freshly toasted sesame bun. The menu at Beep’s Burgers hasn’t changed much since it opened in 1962 and neither have the prices. Bring cash to this drive-up joint (no seating inside) and get a "1/2 Pounder Basket" (with Beep’s "one of a kind" special sauce) for $4.44. Bacon will cost ya an extra buck and you’ll need 92 cents for a soda to wash it all down. Oh, hello Niman Ranch chuck, aged cheddar, pickled red onion, bread & butter pickle, garlic aioli, pan de mie bun, and last but certainly not least: bacon jam. Come a little closer so we can EAT YOU. If you’re a burger control freak, Jenny’s Burger was made for you. The ground chuck patty is cooked on a rotating fire grill, but the toppings are based solely on the decisions you make at the condiment bar. Jalapeños, olives, cucumbers, banana peppers, and beets (if you’re determined to make it the grossest burger of all time). The Beef and Bacon Burger is just that: beef and bacon, ground together to live in one harmonious patty, topped with American cheese, pickled onions, pickles, house mayo, and ketchup. And don’t be one of those people who asks for it without the mayo. Just don’t. A pat of butter is placed on top of the beef right before it hits the flat top, which is a way bigger deal than you’re thinking, because that pat of butter? It’s responsible for the burger’s perfect crust. That, combined with the white cheddar, caramelized onions, Little Gems lettuce, and tomato on a pan de mie bun, makes it worth both the trip to the Marina and (most likely) the wait. It’s a trick, dog. See, the hamburger here... it’s also a hot dog. Kind of. The house-ground blend of chuck, brisket, and sirloin is shaped like a brat, placed into a buttered-and-toasted bun, and then topped with lettuce, onion, pickles, cheddar cheese, and house sauce. 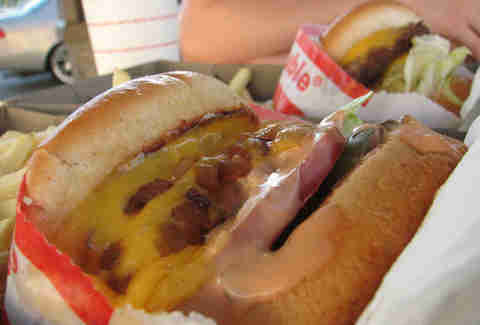 Once you take a bite, you’ll wonder why all hamburgers don’t come shaped like hot dogs. 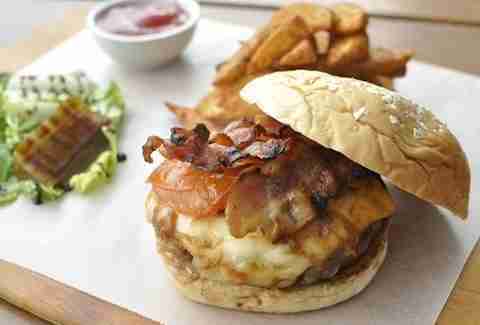 Most of the time you’ll go to Grubstake for their Portuguese menu, but one time you should try the burger. The Nugget Burger, to be exact. It’s a cheeseburger with bacon and a fried egg, and it’s delicious. Ground chuck, grilled onions, tomato, and greens, all on a brioche roll. A true classic. 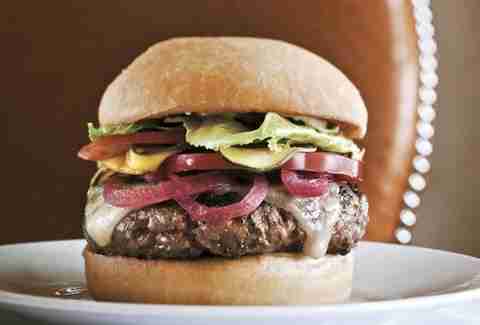 The Marlowe Burger might be the most famous burger in SF, and for good reason. There’s a little bit of lamb ground in with the beef that gives it an earthiness. And then, of course, there’s the crisp bacon, cold shredded lettuce, cheddar cheese, caramelized onion, and horseradish aioli. Dude. You're drooling. It’s only fitting that you order The California Burger at this spot right by O.B. It comes on a toasted bun with bacon, cheese, and almost an entire avocado. 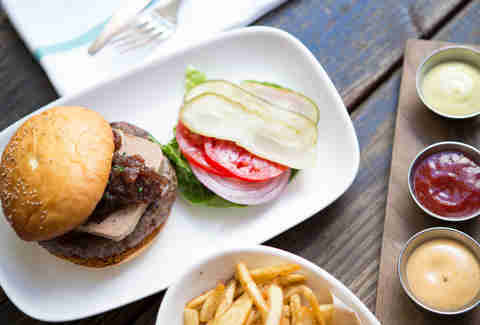 Chez Maman named their Basic Burger before being basic was even cool. How very basic of them. The burger has lots of spices in the meat and comes on a ciabatta roll. Add Brie and avocado because, why not? Remember when you were a kid and your mom would put your hamburger on an English muffin and you seriously resented her for that and you’re still talking about it in therapy today? No? Well good. Because the burger at Spruce comes on a buttered English muffin and it’s absolute perfection. Plus, they make their herbed caper aioli in-house and your mom probably just gave you ketchup. FYI: it’s only available at the bar, or in the main dining room during lunch and Sunday brunch. The Street Burger might be the best thing on the menu. It’s huge, so you’ll think about not finishing it, but you’ll do it anyway. Add fire-roasted onion and Gruyere. Does it seem weird to order a cheeseburger at what's essentially a taqueria? Maybe a little, but order the Drive In Cheeseburger anyway. It's 1/3lb Certified Angus, double American cheese, griddled onions, pickles, lettuce, tomato, and 1000 Island dressing on an Acme bun. All for six bucks. Boasting "a classic set-up", the Mikkeller Burger has house-ground chuck and goes perfectly with one of their 42 tap or bottled beers. And even perfectly-er with two. It comes with a side salad or fries. Get the fries. That’s an order. When Maverick closed in 2013 because of a fire, all of San Francisco mourned the loss of one of the city’s best burgers. But it’s back and butterier than ever. Yes, that’s right. Butterier. The Meyer Ranch chuck is literally sent through the grinder with chunks of delicious buttery butter (SERIOUSLY) to create what can only be described as burger perfection. 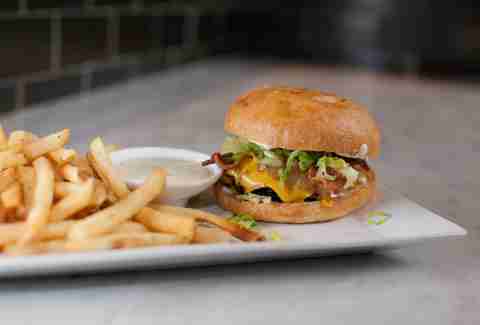 The Upper Haight isn’t known for its burgers, but if you’re in the area and get a hankering, Magnolia’s Pub Burger won’t let you down. Marin Sun Farms pasture-raised beef can be topped with chedder, Gruyere, blue cheese, Hobbs’ applewood-smoked bacon, and even an egg. But mostly just the cheddar and bacon. Bull’s Head has 14 burgers on its menu and you can choose whether to get ground beef, turkey, or buffalo for each of them. All of the combos are delicious, but knowing you, you’ll order The Challenger with buffalo: a charcoal-broiled burger with avocado, bacon, cheddar, jack, mushroom, and onion. Warning: once you make the trek the first time, you’re going to have to make it again. And again. And maybe again. It’s that good. C'mon, the burger is actually named "The Best Damn Cheeseburger". Order a double and grab a table on the patio. Or, grab it from their late-night takeout window until 2am on Fridays and Saturdays. Or do, um, both? Daisy Barringer is Thrillist's SF Editor and she's embarrassed to admit she's the kind of girl who cuts her burgers in half. Give her grief on Twitter @daisy.